Our Featured Crafter of this week is Diva Glitz. 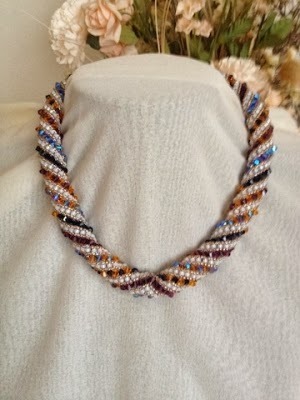 She creates stunning necklaces, bracelets and earrings for casual days or for that exciting night out on the town. Also she makes gorgeous cards for anniversaries and special events. 1. How did you start crafting and how long have you been doing it? I started about 10 years ago, after a friend showed me a card she had made, that was the beginning for me. I made them by quilling, using stencils for paper pricking, and on parchment. Although I made them for myself at first, i went to a craft class with friends who said I ought to try selling them online. 2. How long after listing an item you had your first sale? It took a couple of years before I sold a card online, everyone was making cards so the competition was stiff. I sold more via friends and by word of mouth. But I did do a special order for wedding invitations online. 3. Can you give us some tips on how you promoted your work ? I found that the best way to get noticed was by showing my work/cards to friends, at coffee mornings. Making flyers and putting through neighbours doors, adverts in local shops. 4. Tell us about your crafting space..
Well my dining room is now my work room, cupboards full of beads and books and I still need more storage space. My desk has small storage stacks for my beads, needles etc and a bright desk lamp for intricate work. 5. What are the main problems a crafter faces especially when he is in the beginning? Competition and selling. Whatever the craft is, others can do the same, so the cost/selling can be lower than yours. You have to recoup what you have spent out on without making a loss. 6. You are a card and jewellery crafter. Do you have in mind something else you like to start crafting? Well I have made cards, now making jewellery, but when I have spare time, I do knitting and crocheting. Made frilly scarves and shawls, boleros and sold them at craft fairs. I think that's all I can manage. 7. What is your main source of inspiration and when do you feel more creative? I am inspired by books on crafting jewellery making, magazines. Seeing something catches my eye then adapting it to my design. I have to be inspired in order to be creative. Sometimes I don't do anything, taking a break away from it is necessary. Coming back to it with a fresh approach gives me the inspiration and creativity. 8. How did you find MISI? I was Googling for having an online shop and Etsy, Foksy and MISI came up, having checked all out, decided MISI looked far more interesting. Thank you for chatting to us today Dani. Visit her lovely shop, Diva Glitz, on Misi.